How has Vermont's climate changed? How will Vermont's climate change in the future? The frost-free season will likely increase by several weeks, with more rain and less snow in winter. The number of hot days reaching 87°F or warmer are expected to increase from about six per year currently to more than 20 per year. The heaviest 0.1% of precipitation events (about 3 inches of rain or more) will increase in frequency from once every seven years to once every two to three years. It is important to remember that climate change has long-term impacts, but that weather patterns will continue to vary widely year-by-year and place-by-place. Even while the Earth has experienced an overall warming trend in recent years, some locations have experienced short-term conditions that have been colder than normal. 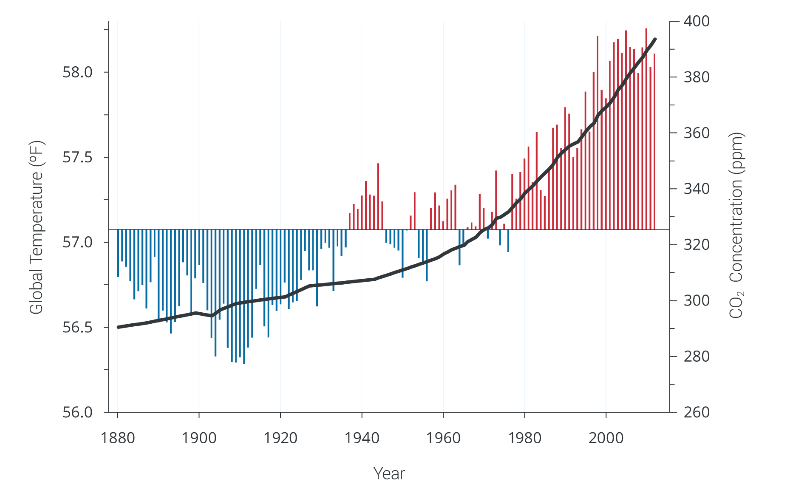 Climate change is a long-term change in the typical weather conditions of a particular location, which could include warming, cooling, or changes in precipitation frequency or intensity. Natural occurrences—including ocean currents, volcanic eruptions, solar cycles, and variations in the earth’s orbit—contribute to climate change. However, between 90% and 100% of publishing climate scientists agree that human activity is contributing to the climate change that we are currently experiencing,1 primarily because of fossil fuel emissions and land use changes.2 There has been rigorous scientific study into the causes of climate change, and natural processes alone cannot account for the warming average global temperatures observed over the past century. Burning of fossil fuels is the most significant contributor to climate change.2 Oil, coal, and natural gas, used to generate electricity, heat homes, and run cars, produce heat-trapping or “greenhouse” gases including carbon dioxide, methane, and nitrous oxide. 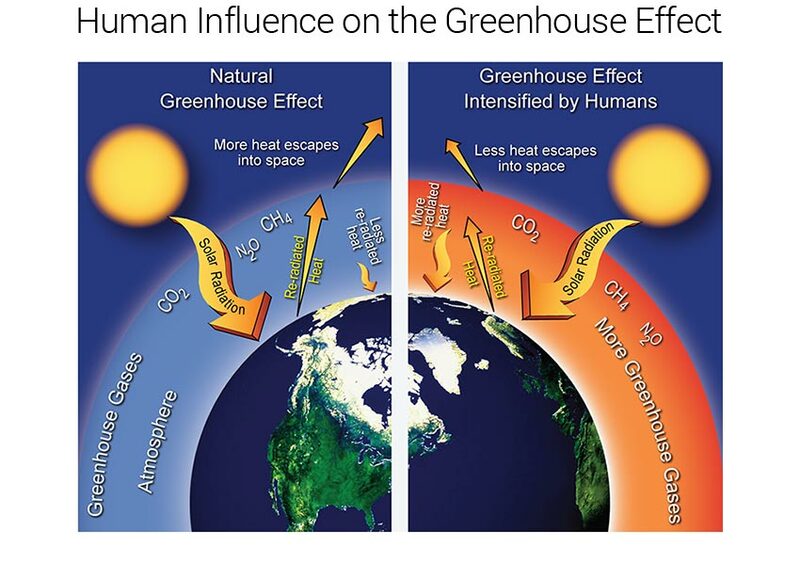 Greenhouse gases act like a blanket, trapping heat in the earth’s atmosphere as it radiates away from the earth’s surface. As concentrations of these gases in the atmosphere increase, this warming effect intensifies. 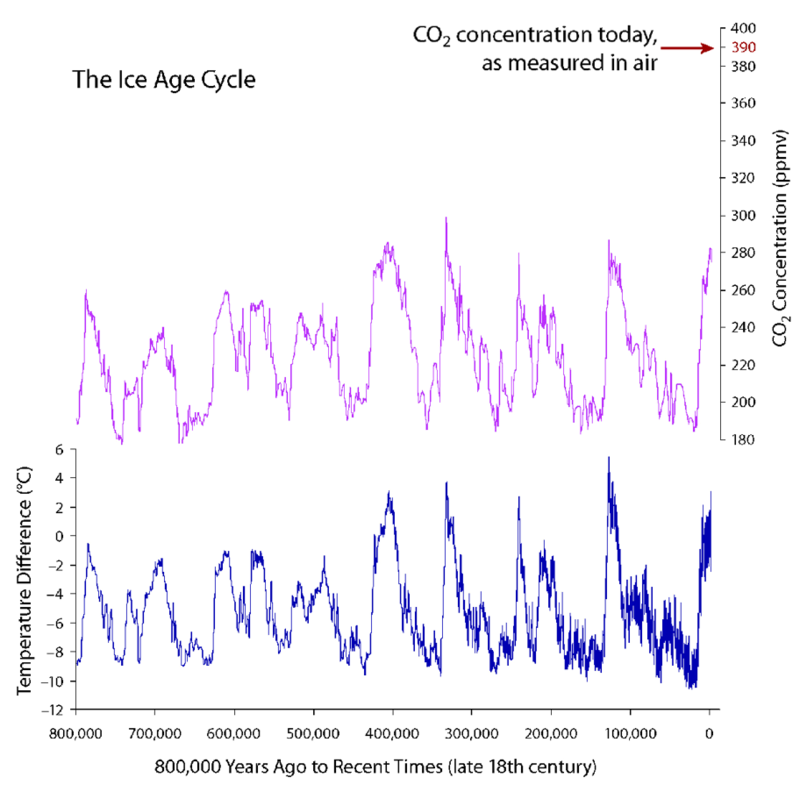 Over the past 800,000 years, higher concentrations of greenhouse gases have been associated with warmer global temperatures, while lower concentrations of greenhouse gases have been associated with cooler temperatures.2 From 800,000 years ago until about 1950, carbon dioxide levels fluctuated between 180 and 300 parts per million. Since 1950, carbon dioxide levels have spiked to over 400 parts per million, and global temperatures have risen accordingly. Land use changes also contribute to climate change.2 Removal of forests, urbanization, and some forms of agriculture can result in additional greenhouse gas emissions, reduced water storage and evaporation, and increased surface warming. The size and scope of these human activities are causing the Earth to heat more rapidly than it would from natural causes alone. How can I learn more about climate change? 1 Cook, J., Oreskes, N., Doran, P. T., Anderegg, W. R., Verheggen, B., Maibach, E. W., ... & Nuccitelli, D. (2016). Consensus on consensus: a synthesis of consensus estimates on human-caused global warming.Environmental Research Letters, 11(4), 048002. 2 IPCC, 2014: Summary for Policymakers. In: Climate Change 2014: Impacts, Adaptation, and Vulnerability. Part A: Global and Sectoral Aspects. Contribution of Working Group II to the Fifth Assessment Report of the Intergovernmental Panel on Climate Change [Field, C.B., V.R. Barros, D.J. Dokken, K.J. Mach, M.D. Mastrandrea, T.E. Bilir, M. Chatterjee, K.L. Ebi, Y.O. Estrada, R.C. Genova, B. Girma, E.S. Kissel, A.N. Levy, S. MacCracken, P.R. Mastrandrea, and L.L. White (eds.)]. Cambridge University Press, Cambridge, United Kingdom and New York, NY, USA, pp. 1-32. 3 Betts AK. Vermont Climate Change Indicators. Weather, Climate and Society. 2011: 3(2); 106-115. 5 Smeltzer E, Shambaugh AD, Stangel P. Environmental change in Lake Champlain revealed by long-term monitoring. Journal of Great Lakes Research. 2012; 38(Supplement 1): 6-18. 6 Vermont State Climate Office projections developed for the Vermont Department of Health, 2014. Climate change will affect everyone, but certain people and certain places will be affected more than others. Responding to climate change will benefit health now.